Gastronome Madjid Djamegari opened Germany’s most innovative nightclub GIBSON and for the musical aspect chose experts Sascha Schwind, Michael Herberger and Xavier Naidoo (Söhne Mannheims GmbH) as his partners. Moreover, the ex-owner of the gastronomy brand King Kameha astonished his guests with his latest design concept, a melding of rock ‘n’ roll, glamour and industrial charm and in July 2012, GIBSON was awarded the World’s Finest Club Award. 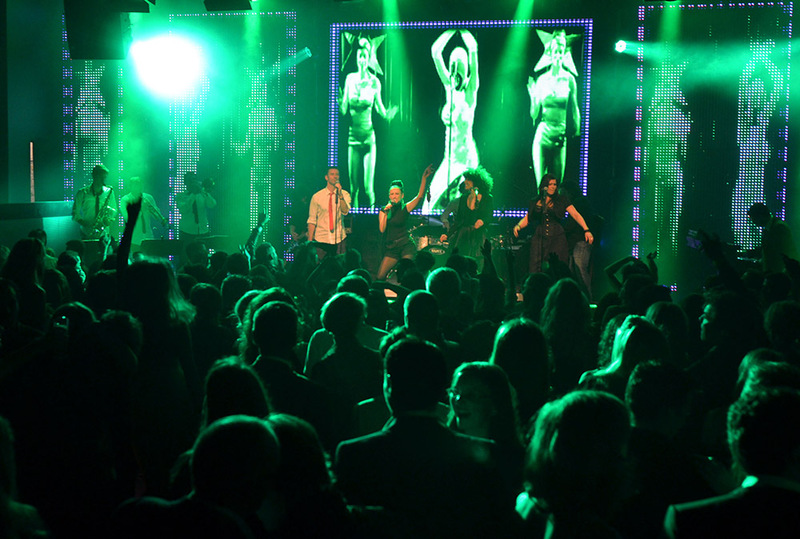 Madjid, GIBSON head and general manager, knew a worldwide technology brand would be required to meet the venue’s high standards and turned to Martin Professional moving heads, LED video, control and smoke products for the prestigious nightclub and live music venue. Madjid wanted style to define the downtown Frankfurt venue while honoring the building’s original charm and existing architecture, and the result has been a great success. After visiting the Martin Professional booth at Prolight + Sound 2011 in Frankfurt “he left the booth with the impression that he had not only found the right products, but also the right partner to fulfill his vision,” said Martin Germany’s Stefan Wagner, who oversaw the lighting and visual installation at GIBSON. The brief for the new lighting system called for it to be outstanding, breathtaking, multifunctional (to cover both the club and live performance needs), easy to use, affordable and LED only. A 50 m2 stage acts as the heart of the club, its focal point a back wall LED screen made up of 32 Martin EC-10 LED panels and 12 Martin LC 2140 LED panels. The EC-10s form the center of the screen while the LC 2140s provide the frame. Comprising only LED fixtures and simple to operate, a multifunctional lighting rig gives an outstanding light show. Two circular truss structures, as well as four crescent-shaped truss structures, are mounted on the ceiling overlooking the dance floor. A third section of truss sits above the front of the stage, while the back of the stage provides the final mounting point for the lighting fixtures. A total of 40 Martin MAC 101 compact moving heads, 18 MAC 350 Entour LED fixtures and 22 MAC Aura wash lights are configured on the trusses. The main challenge faced with the lighting design at Gibson was the need to create suitable lighting for both stage and dance floor applications, all from the same lighting fixtures. The combination of the MAC 101s, the MAC 350 Entours and the MAC Auras helped meet the goal. Alongside the Martin P3-100 video signal processing and distribution unit that takes control of the LED screen, Gibson is equipped with a Martin M1 console and a Martin Maxedia Broadcast unit for media composing and playback. Together these three control elements fully integrate the lighting and visual technology, and provide an easy to use, simple to operate system ideal for either live or club environments.